Do you have it? Can you get it? Where do you find it? What does it look like? How do you use it and where do you top up when you run low? EVERYONE TALKS ABOUT IT AS IF IT WAS SOMETHING YOU CAN PURCHASE. IT’S LIKE THE WORD PROFESSIONAL – WHAT DOES IT MEAN, ACTUALLY? THIS ISSUE OF SELLING TRAVEL WILL HELP YOU FIND THE ANSWERS. I use this word a lot as I am sure you do, too. Everyone seems to use it. Air Canada Vacations names it’s brochure with it. I Googled “travel passion” and 24 million results came back. There is a lot of passion out there that’s for sure. Who’s got it, how do you get it, how to use it and what if you don’t have it and can’t get it is explored in this issue. Some people have it and lose it, too and we take a look at where and how you can refuel the tank. Don’t forget, if you need help with anything you read in Selling Travel I am as close as your email or Skype button. 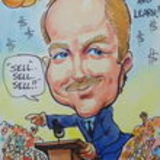 JOIN ST MAILING LIST Selling Travel is owned and published by Steve Crowhurst, SMP Training Co. All Rights Reserved. Protected by International Copyright Law. Selling Travel can be shared, forwarded, cut and pasted but not sold, resold or in anyway monetized. Using any images or content from Selling Travel must be sourced as follows: “Copyright SMP Training Co. www.smptraining.com” SMP Training Co. 568 Country Club Drive, Qualicum Beach, BC, Canada V9K 1G1 Note: Steve Crowhurst is not responsible for outcomes based on how you interpret or use the ideas in Selling Travel or on the Selling Travel Website. There are a few types of passion. Various levels of it too. There’s passion that can get you 20 to life and there’s passion that forms your identity and makes your life worth living. It gives purpose to your life and to those around you and those associated with you. Controlled passion is enlightening, inspiring and clients know when you know as they see the light in your eyes, those gateways to your soul that should always be bright when engaged in selling travel and helping someone, a client, fulfill their personal journey, their inner dream they have harboured for so long and now about to step out with your help and make it all come true. Your eyes say it all. I’ve seen some passions fold up and go home, too. The challenges of the industry have dulled the passion that was once present. Passion to sell travel is related to stickability, endurance, tenacity and tapping into the creative idea gene. Unfortunately the industry is such that it’s often under attack from all things global PLUS the 6’oclock news anchor who has decided to tell the world that ‘cruising is dying’ that this destination or that destination is out of bounds because a tourist lost their life there, there are drugs, civil unrest and so on. Today, that could represent your own town, city, state or province and even the country where you live. Having passion for travel means you would go larger than life to present the truth to your clients and explain what is actually happening at the destinations you are selling. Being passionate about the travel industry then is more than taking a free FAM. Let me know what you need! Creatively Yours! Steve Crowhurst Author, Trainer, Columnist, Keynote Speaker, Publisher and world traveller. My route to my Personal Passion started early for me. Teachers labelled me a ‘day dreamer’ – I would factor in some sort of adventure into every essay required of me. I ran to get the window seat so I could stare outside and dream of travelling. At age 12 or 13 I was planning my world travels. I was writing to travel agencies and tourism offices for maps and brochures. Upon leaving school at 16 I took the train to London (UK) and found my first job in travel. The headmaster had me picked to be a pipe fitter or a bus driver! At age 18 I was working onboard my first ship heading for Japan. At age 19 my passion had taken me around the world and back. My passion now is teaching creative ideas that are New Business Generators for the travel trade. What was your route to your travel passion? Can you share it? Publishing later this year. Dream Merchants tells the story about what you do. It’s a reference, a business guide, a playbook, a book based on success and succeeding as a travel agent and explores what it takes to ‘make it’. Dream Merchants also reviews the success traits that have been inherent in travel agents for 170 years since the industry as we know it, started in the mid 1800s. Would you like to participate and tell your side of the story? Is your agency a passionate place to work? Are you passionate about the business you own, manage, supervise, run, oversee… or have you bought into the doom and gloom the anchor men and women are pitching every night at 6pm? If you have, then those same vibes are being picked up by your frontline team and if that is happening, then your clients are picking up those same vibes from the counsellors they do business with. In a word – this is not a good business model. You’ll need to refocus and rebuild the team passion. Now it could be that you are on point and feeling great about where the industry is going and happy with the business you are doing. It could be however that your manager and or your sales team have made their own decisions and bought into the doom and gloom and have subconsciously checked out. It’s possible they have lost the passion and haven’t realized it. Usually there are signs of this happening. Dress and grooming take a back seat. Mistakes are made and the level of service drops. Clients, long term clients have defected to the competition. These are signs of a passionless travel agency. How can an excited young person embarking on their first overseas trip, or a couple celebrating their 50th year together bring their dream to your agency when there is a dark cloud hanging over the front door? If this is making sense to you then you must engage your team and start to repair the dent. Yes! Let’s start with chocolate things. They always perk up an audience. Next… it’s a good old staff meeting where you talk about what’s going on, and the perceptions and vibes that you are picking up. There will be a need to prove people wrong and that’s okay. There will be a need to share the numbers and that’s okay too. Transparency is the keyword here. Once you have proven the team’s concerns to be baseless, i.e. all suppliers are going direct, my clients aren’t travelling anymore, no one calls us anymore, fewer people can afford to travel… the world is at war everywhere my clients want to go… I’m fed up, the fun has gone… ‐ you will hear it all. Some of it is true, some it has never happened, much of it has come and gone in the past, and will repeat – but then that’s the nature of the travel industry. There are fundamental challenges and they will always be part of the industry. You must show your team a way through the mess. You must challenge them. Set each person a task. Have more meetings, good meetings, fast and educational meetings (not the boring, yappy type) and remove the doom and gloom with bloom! Counselling customers with the level of passion they deserve FRONTLINE salespeople in so many businesses today are generally not the happiest, the most gracious or the most passionate about what they do for a living. A typical client then, has become oblivious to the level of service they receive and is only expecting 50% of the 75% they usually experience. Imagine their surprise when they meet YOU and the level of passion you display and the love of what you do comes across the phone, through email and across your desk when they visit your agency to book their trip. Now that’s what I’m talking about! Did you know that you exude PASSION! Did you know that through your excitement for your product, that you actually cause the customer in front of you to make that booking? It’s true. Your energy, your ‘infectious enthusiasm’ as Steve Gillick of TalkingTravel refers to it, will cause your client to pick up on your vibes and that in turn causes their travel gene to spark and hey… we’re all so excited we can’t stand ourselves – and ka ching goes the credit card. You just won gold in closing the sale! Well done you. So now the question: Are you passionate about the job you do, the career you have embarked on and can you deliver when you have to? When you are face to face with a client they are looking at you for not only guidance based on your personal experience, but also your personal excitement about their trip. You can show your enthusiasm and passion through your body language and the words you use when engaging your client, no matter the vacation they wish to book with you. A world cruise should elicit a “Fantastic!” from you. A 2 day Las Vegas package a “Now that’s going to be a lot of fun!” A trek to Base Camp, “Oh yes, I wish I was going with you on this one!” You get the picture and if you do get the picture then you must also paint it for the customer, dab some bright colours on it, add some new lines and shadows and highlights too. In other words you are taking their request, turning it around as an ultra positive thing to do, supporting their choice of travel and putting some OOMPH! into their decision, their completion of a personal journey or their dream trip they’ve been planning for years and in some cases a lifetime. Everyone, no matter where they are going deserves a little passionate push, a nudge, a confirmation from you, the guru of travel, the DREAM MERCHANT, the person who knows the world, a master of your domain and knowledgeable to boot. If a colleague in your agency is less then enthusiastic this large lingering cloud will also overshadow you. Make sure you have a chat with them and see if you can lift up their spirits. No one wants to spend two‐ thousand dollars to fifty thousand dollars with a sour‐ faced old travel agent! That would not be the best way to start a vacation. Go for the Passion each time, every time. the cutting edge of industry skills and knowledge and then, with some clients, acting as the proverbial psychiatrist, marriage counsellor, financial advisor, medical clinic reference, best friend, business consultant, wedding planner, adventure practitioner…whew!...and more. And then of course when you request the Service Fee for your time, energy and expertise, the client balks and suggests that ‘they will think about it and get back to you”. And for this you are claiming ‘passion’ to be your motivation? Well, hard to believe but some travel professionals are able to look at the ‘gestalt’: the entire picture. They love to travel, they love to talk to people who love to talk about travel and in the spirit of striving for perfection, they love to do the work, as well as add in the extras, that will give their clients an amazing experience. Satisfaction comes from a happy client who will likely, but not always, return to that travel agent or refer friends to that agent. Satisfaction comes from challenging yourself to do the best you can, and then some, for every client who travels, whether it’s a simple flight booking, a pre‐ planned package tour or a multi‐component customized travel experience. For some, this is the yield of ‘passion’. And there are travel agents who take the time to expand their horizons in a number of ways. Some have learned about the psychographics of travel: what motivates people, generally and specifically, to want to get out of their daily routine and travel somewhere different. This in turn can lead to getting to know your clients better and opening up a whole new world of experiential facilitation. This is where niche market training comes in to play when you learn that your client is an avid birdwatcher, or adventure seeker or golfer or family‐ oriented traveller. Satisfying these needs becomes a positive challenge, as the travel agent is also learning at the same time. Knowledge, research, client interaction and, yes, fun, begets satisfaction, and satisfaction in turn, results in a build‐up of passion. Other travel professionals are destination‐addicts! Their passion for the industry translates into the absolute joy of discovery; talking to people in different countries and getting to know them, accumulating bragging rights for all the cities and towns and countries about which they can comfortably talk to their clients while at the same time, sharing a memory of something that they personally did or saw while at that destination. And travel comes with understanding, exploring, tasting, sensing, feeling and fully immersing yourself in the destination. Passion translates as a love for exercising a need and an appreciation for understanding the globe and thereby taking home with you, global understanding of people and countries. Passion takes on concern, when one of these countries is experiencing challenges and you can empathize with what they might be going through. As in any aspect of life, those who are in control of their passion will use it to enhance their own life values and career opportunities: making the most out of what they perceive to be a positive inspiration and possibly even inspiring others towards positivity and enthusiasm through leadership‐by‐example. Emotionomics speaks to how suppliers market their products and services, with the emotions of the end‐ user in mind. A red box may attract more attention than a beige box; a humorous ad may draw in more consumers than a tough‐sell campaign. For travel and tourism professionals, passion can be the emotional draw for clients who share the same values of wanting to change, explore, discover or simply relax and watch the blue water lap against the shore or see the sun set. Passion about travel, passion about details, passion about doing a great job and passion about career satisfaction can bear the fruits of a personally fulfilling lifestyle. The next time someone states that s/he is passionate about travel, delve a bit deeper to understand what they mean and how this may translate into revealing advice about travel needs with which you may be able to identify, and ultimately satisfy. Denis Diderot, the 18th century French philosopher noted that “Only passions, great passions can elevate the soul to great things”. Today, in the secular sense, and through exploration or relaxation of both close‐to‐home and far‐flung destinations, if travel is in your soul, then ‘passion’ is most likely your guide. Steve Gillick’s first article appeared in the Dunera Ship Newsletter in 1967. Since then he has written extensively about travel. He authored the Scam Watch column in Canadian Traveller Magazine for many years, wrote and edited CITC’s industry and consumer newsletters from 1995 to 2012, authors a column in www.TravelIndustryToday.com , since 2010; composes travel blogs at www.talkingtravelblog.ca, contributes articles to www.sellingtravel.net, and pens press releases, special event observations and letters to the editor on a regular basis. OKAY, okay… calm down. Not going to go ‘there’ – just focus on the business end of the passion for what you do, and doing it from home. I hear more than once that there’s little support for what you do, as in trying to build a home based business selling travel. One way to engage your partner or your family, your kids… is to involve them in the research. This is a behind the scenes role, it’s an important role, and it is something you need if you wish to reduce your own research time which you can then invest in more marketing time. If your own passion for the world shines through and even more for when a customer gives you a fascinating and perhaps difficult trip to arrange, well, there’s your sign. Advise your new support team about the trip, show them where this customer is going on the map, or trace it with your finger on pages in an atlas and then what else can you do? Try asking one of your team to open Google Earth and go for a digital walk‐about as you explore the streets, go back up and over and look down on the area… zoom in again to street level. You are taking your team on an virtual tour of the places this customer is going to. Next you look for videos online, at the tourism website and of course YouTube. I’m looking for real‐time challenges that stop you from being the best you can be. Be sure to include your email and website links. Thanks! You are by now getting the picture. You are using all the available tools to excite your home team and to win them over to be more passionate about your new business. Perhaps you’ve been ‘in the game’ for ten or twenty or thirty years and somewhere along the line you packed up, left the downtown office to go home based. All of this is a good thing to do as long as you took with you the energy and passion you must display when downtown. Being at home can sometimes dull the senses. It can move you to a zone that’s perhaps too comfortable. When you need to tap into some passion, to rev up your energy why not Skype with your home based colleagues? You can use the pro version of Skype and have 10 video feeds, Go To Meeting gives you 12 video feeds and oovoo.com also offers you 12 video feeds and it is FREE. So there’s your mission if you choose to accept it. You will endeavour to turn on and turn up the home‐based passion, get your home‐based team engaged and spread the energy to your colleagues through the social tools now available to you. And don’t forget the KISS principle either. Nudge, nudge. I SUPPOSE YOU DO KNOW THAT YOU ARE LOOKED UPON AS A LEADER IN THE TRADE DON’T YOU? IT’S TRUE. AS A BDM, YOU ARE LOOKED UP TO BY TRAVEL COUNSELLORS AS THE PERSON WHO KNOWS AND THAT YOU ARE THE ANSWER TO THEIR MARKETING AND SALES NEEDS. YOU ARE THE SOURCE! That’s a heavy burden to bear especially if you are not feeling the same way about yourself as your agency accounts are thinking about you. As your agency accounts owe their customers the best of their knowledge, the same applies to you when you service your customers, your agency accounts. So now the question about PASSION for what you do, comes to you. Are you PASSIONATE about your role in the travel industry, are you committed to it, can you express it and can you inject others with your own Infectious Enthusiasm as Steve Gillick of TalkingTravel.ca describes this trait that all suppliers should be trained in. Let’s review your next round of agency visits, your webinars and your fall conference presentations. What’s on the PASSION SCALE for you? How will you pass on the passion to your audience who are eagerly waiting on your every word? Next question: Where do you go to top up your PASSION tank? Where do you refuel? Who delivers the PASSION to you in such a way as to help you remain committed to the brand and all things head‐office? Your role is one of “Show You Know” meaning you MUST be able to demo and pass on your knowledge. HERE’S HOW YOU CAN SHARE THE PASSION YOU HAVE FOR WHAT YOU DO: q Talk about the awesome people you deal with each and every day… talk about what they are doing to sell more of your brand. q When you come across an uplifting business related article about how a travel agency went from zip to something… send it out to your agency contact list. q A passionate quote about making things happen is always a nudge in the right direction. q Use your webcam to video yourself delivering your next sales tip. Stretch the limits of what you can do, lead by example and use the technology as a way to impart your passion and show others how to use it. Okay it’s over to you now. Dress your best and go show your colours to your agency accounts. Offer more training than the competition and get in front of your selling teams – the people who sell for you. The people that earn you that bonus! Do YOU have the PASSION TO TRAVEL? What a daft question I know. But do you? Now when I mean travel, I mean as a traveller not a tourist. Mind you it’s tough not being a tourist in some sense of the word, but what I’m driving at and what will ‘sell’ your clients on doing business with you is when you appear, in their eyes, as a true traveller. Someone who travels with a lust to wander, to explore, to take the road less travelled and to engage with the culture at every step of the way. Versus sitting in a deckchair beckoning another gin and tonic, prior to the gorging at the buffet. Can you remember that feeling when you first quit whatever it was you were doing in life and work and started out, on the road hitchhiking, to the airport to catch that first flight, getting on that train or gassing up that car of yours to hit the road? There is an ultra moment there when all internal and external planets align and you have this enormous feeling of freedom. Nobody owns your time. Nobody owns your next move. All decisions are yours. You can go and do whatever you want. You meet fellow travellers along the way, you sidetrack for awhile and then you return to your normal and your plan. One of the pleasures of travelling is meeting up with those that have travelled more than you, learning about their passions and places, where they are going to go back to and their own series of personal journeys and their ultimate dream trip. In a group like this, saying that you have travelled here, or there is not about boasting, it’s all about sharing the love of the road, the passion to travel. If you are working for a travel company, a travel agency, then chances are your away time is restricted to FAMs and 2 or 3 weeks of vacation. If you are home‐based then your time is your own and you can make good on that PASSION to travel anytime you wish. Believe it or not, some people in the travel industry do not like to travel! Fact. It can be understood what with all the hassles of getting there, starting with the traffic hold ups just to make it to your local airport on time. Then there’s the taxes, the in flight experience, the potential for riots, terrorism, war, weather systems, political unrest, accidents, deaths… OMG! Better to stay home and be an armchair travel agent. Ya think? Well for some, it has gone this way. If you have succumbed to the hassle of travelling today then perhaps it’s time to get back out there and strike up a relationship with ‘the road’ and hit it one more time. You could strive to go further a field or you could travel your own country. Now there’s a thing. The PASSION to TRAVEL your own country. Your own neck of the woods even. So few of “us” do this. It’s amazing, but it’s true. How many countries have you been to. Answer: 54. How much of your own country have you explored? Answer: Well I’ve been downtown a few times! FACT. So there’s a new travel Passion for you and a new niche if you are looking for one. Know your own country and sell it like you know it. Have you witnessed the caribou migration? http://www.thelon.com/carboo.htm ‐ It’s on my list. Have you ever driven Route 66? On my list. Crossed the Bear Tooth Mountain Range. Done it! I’m sure you agree, that there is just no feeling to match the feeling you get when you set out on that first journey. That slight trepidation that you are doing what you promised yourself you would do. You are showing yourself that you have the guts to do it. A powerful moment in anyone’s life. Go to the Passion! Many years ago I read an article about blue chip firms, you know the big guys, and how they stay on the cutting edge of information, the information that keeps them at the top of their game. The term “a learning organization” was created. That term and the information about having your team’s knowledge cutting edge and just seconds old, is truly something to take a hard look at. I know of travel firms who cut training and development when times get tough. FAM trips are reduced or cut out entirely. Whereas the blue chip firms, ramp up anything educational so that when the doom and gloom clears they are way out front, leading the pack. Of course we’re talking about the sales team, frontline travel counsellors, the agency management team and even more so, the senior management and executive team. To cut training and development means to reduce or lose the PASSION of your people. Imagine, as an employee how disheartening it would be, that when times get tough, management retreats to the cave. Now they do it under the auspices of “saving on expenses” whereas those that know their game, know only to well, you can only save so much. The real action is in generating new business and in tough times that comes from equipping the sales force with new knowledge. Back to those blue chip firms for a moment. I came across a more recent and similar report about a large company and how many hours they invest into their employee training. The company in this report is IBM. Sure it’s huge and they didn’t get that way by turning off the lights. This information is about five years old, however it’s the numbers that are important and how IBM expresses it’s commitment and passion for educating it’s entire workforce. IBM has received the #1 ranking in Training Magazine's "Top 100" for its outstanding learning programs for the second consecutive year. The publication ranks those companies that understand, embrace and use training to achieve real business results, support corporate values and enhance the work lives of employees. IBM employees spend an estimated 16 million hours each year (about 50 hours per employee) in formal training ‐ online, either through online learning activities or in a traditional classroom. IBM's investments in training prepares employees with the skills they need now and in the future. "Learning is truly core to the DNA of IBM. We are a company focused on innovation, and our executives understand that we need to enable IBMers to grow and to foster the practices that produce business transformation," said IBM Chief Learning Officer Ted Hoff. "Our learning programs are specifically designed to enable IBM to bring increased value to our clients and to provide meaningful learning experiences to all 330,000 IBMers." Building the expertise of a 21st century workforce requires a fresh perspective and breakthrough thinking. "A growing discontinuity exists between what business has become and what training has remained," explains Nancy Lewis, Vice President, IBM On Demand Learning. "Our On Demand Learning strategy allow us to shift the emphasis from 'bringing the worker to the learning' to 'bringing the learning to the work' ‐ an exciting new era of learning that promises to leverage the collective expertise of employees, teams, and organizations throughout its enterprise." What differentiates IBM as a world class training organization? Simple ‐ IBM provides learning programs that are aligned to a company's strategy, reflect its values, and drive greater performance and results in every area of the business. "A belief in the value of learning is embedded in the very DNA of IBM. It's not surprising that for the second year running, IBM has captured the top spot in the Training Top 100 ranking," said Richard Ausman, publisher of Training magazine. How many hours are you investing each year in your team? How old and cutting edge is your knowledge? What is your training & development strategy this year? Where is the PASSION to LEARN? Correction. If you are a travel agent then you are a sales person. You are in sales and you’d better get used to the idea, ‘cos that’s the business end of the industry and if you want to eat tonight, you’d better close something not counsel it! Now I have to agree that counselling is part of the job. It’s the part that so many travel agents are passionate about… giving advice, meeting nice people and helping them learn about the world so they can go down the street and purchase their trip from a travel agent who closes after they counsel and a travel agent who knows when to switch lanes and ask for the moola. It’s not the Internet that’s taking your business, or the suppliers that are taking direct bookings, it’s YOU because you have not yet developed that PASSION for SELLING and closing the sale. Being in sales is a marvellous thing when it’s done with precision and passion. It’s like watching and being served by a waiter (no, not a server) who is impeccable in every way. Having the PASSION to Sell means you have in fact studied the art of selling. You have taken selling courses that have been professionally designed for the retail travel agent. Now that doesn’t mean product knowledge – it means selling and understanding the basic steps and tools that will cause the customer to like you, engage with you and want you to be their travel agent of choice. This does not happen because you’ve been to twenty countries and cruised three times. It happens through training and repetitive role plays, just like acting, it’s take‐two and off you go again until you get it right. Once you emerge from let’s say a one‐week sales training program designed specifically for travel agents then you will not only feel more confident you will feel, well, like a professional sales person. You’ll carry yourself with poise, you’ll arrange your desk to be efficient, you’ll dump the fuzzy toys off the desk and you’ll be dressed and groomed like only a sales professional does it. Subtle and sharp. When you have that PASSION to Sell you move to a different level. There is not one client that would scare you and not one request that would send you scurrying to the manager for assistance. The reason for this is that now, you are well read, you are well studied, you can see the world map in your mind, you have read the brochures of your preferred suppliers from cover to cover and you have explored each and every web page on their website. Upon meeting a new customer you have within seconds “read” them. You engage your NLP training and you now frame your questions differently and speak in a way that the client easily understands. You have in fact been trained to ‘pay attention’. It’s a lost art unless you learn it from the sifu with strong sales kung fu! I’ll go back in time to one of my first gone for the week sales training courses. It was held in White Plains, New York. There we were, hour after hour working with our colleagues, then it was someone you had not met before and together you tried again and again to get “it” right. The “it” could have been a greeting, a closing statement, handling an objection, answering geographic questions and presenting what you know and knew to the room full of eager people. That was intense. I don’t have to tell you that sales for the company went up big time. Now let’s get back to you, and the PASSION to SELL. How much do you want to make this year? If your mind is quoting less than $100,000 then perhaps selling travel is not for you. Sales people ALWAYS state more than they can do, and for the reason that it pings a certain part of the brain that says, “I can do that… I’m going for it!” For most sales people they overreach… which means they come in around $70,000 to $80,000. So if your mind tells you that $40,000 is okay, then guess how much you’ll transact. Not enough for a cup of coffee, almost. When someone asks you what you do for a living, I want to hear you say, “I sell travel.” Followed by, “What are your travel plans this year…?” Okay, sure, that was too abrupt… we can soften it to something like, “You look like you need a holiday!” Yeah, that’ll work! Just kidding, although it’s worked before and especially with clients who actually look like they need a holiday – usually they know it as fact and will agree with you. That would be called a trial close and the client closed their half of the close now it’s your turn to close the other half. Your PASSION for selling will be reflected in your eyes, your body language, how you sit, the energy you exude, your choice of words, your greeting and the knowledge you display. When PASSION is there, it cannot be faked. The other person, the customer, will know. They will pick up on those vibes and tune in. If what they are receiving is fake, they will tune out and go somewhere else. This test is an easy one. You just have to read the question and you’ll know the answer immediately. Here’s the question that employers ask to test how passionate a new hire might be about their chosen career path: “How much have you invested in yourself and what did you spend it on?” The question wants to know whether or not you have spent your own money to boost your knowledge and your career. Have you purchased books, magazines, newsletters, taken courses, studied online, attended webinars? Taking FREE courses is fine too, however the commitment to self growth is being queried here. Most people wait for the company to put something on the education plate whereas the passionate person will feed themselves investing their time and money in line with their career choice. In this case travel. So how do you turn on and turn up the level of service to the PASSION level? Well, much of this is so simple if you are already passionate about being best. You arrive at the agency in good time. For some of us that was an hour before opening time. Arriving on the dot doesn’t win any points as it still takes 15 minutes before you are fully engaged, leaving your team to pick up your slack. No pro agent worries about the one hour re whose time it is, getting paid for it etc. It’s what you do to keep your service edge. So, when the phone rings, that email pings and the door swings ‐ the service professional is good to go. They know what’s going on in the world, where the typhoons are headed, if there are any flight delays to major cities, the latest specials and discounts and anything related to their niche has already been read. All systems are go and it’s this way because the service professional uses their time wisely. Now they can focus on the client and listen, yes actually listen to what the client is saying / asking. As a retail travel agent you are an ambassador for yourself, the agency you work for, the brand, your preferred suppliers, your team and in a way you represent the world of travel and every client’s dream trip. A huge burden that requires bright eyes, a ready smile, social skills, confidence and the ability to turn practical knowledge into exceptional service. A burden born easily by the well prepared. So how’s your level of PASSION to Service? What about your team? Anyone need a service attitude makeover? Make sure it happens. The goal is 100% service delivery and a highly paid pro‐team. Where would you mark YOUR level of customer service? What about your agency overall? One thing service professionals know and that is that there is no 10%, there is no going the extra mile, no 110%. If you buy into this concept that there’s more service you could deliver, but it’s actually outside of what you would usually deliver if you were operating at 100% ‐ then pain is coming to you! When someone buys travel from you, they are buying the 100% level. This includes EVERYTHING. Not 90% and if you feel like it you will go for that extra 10%. Agencies who boast going the extra mile and delivering 110% are actually saying they offer lousy service! They are not committed to delivering the 100% first time around. There are holes in their service game. So, don’t fall for this over the top service gambit. As a service professional and a travel agent PASSIONATE about delivering 100% each time every time YOU make sure you stand tall and make it happen as only you can do. If you own and or manage an agency there might be a training need here if your sales team are tied, deflated, can’t quite get to the office on time, trying to do their best, will give it a shot next time… you know the drill. Get your team razor sharp. Drill down to their PASSION and identify it with them and if they can’t find it, can’t rise to the occasion, well I tell you, chances are you wouldn’t want them holding the rope when it’s your turn to climb. Survey your clients as to your level of service, it’s a humbling experience and you’ll know where to upgrade pretty quickly. We are generally supposed to ‘know ourselves” which is easy to say, easy to write and repeat and for some, perhaps most difficult to do. It depends on many things from where we live, how we where brought up, the society we live in, what we were used to and how it has changed to the present day. The trials and tribulations life has sent your way. Once you do know yourself, you can Go To Your Passion. GOING TO YOUR PASSION you WILL feel energized and engaged by your work; look forward to work in the morning; feel great about how you spent your day; have the energy at the end of your workday to experience the rest of your life fully; get excited when you tell people about what you do for a living and believe deeply in the work you do. Travel Agents are tired of hearing they are ”unprofessional, hobbyists, order takers and that the average Joe can book his own vacation online without the aid of a travel agent”. Yes there are tools available for consumers to book their own travel, however the fact remains that the excitement of a great price is instantly forgotten when the consumer experiences the bitterness of a badly planned vacation. Three Travel Agents have started a revolution. Mary Clegg and Cory and Cheri Andrichuk are founders of the "Travel Agent Revolution", a company dedicated to "shouting from the roof tops" the value of using a professional travel agent. The Travel Agent Revolution is a grassroots movement. It’s about putting travel agents FIRST. It is about helping all travel agents from all walks of life understand that they matter in their business; that personal and professional development are just as important as product knowledge when it comes to selling travel. The Revolution offers innovative business resources that will teach agents how to brand and market themselves and then align with the correct products to sell. Agents will discover who they are, what they want to achieve and how to define their success, not someone else’s definition of it. Travel Agents who join the "Revolution" will be trained on how to market themselves and grow their business based on personal branding and their professional passion for travel. "Our mission at the Travel Agent Revolution is to provide a roadmap for travel agents to build their own brand and business, focusing on personal and professional development and training and not just product training. Finding out why the agent is in travel, what their passions are and then fitting the right products that relate to their passions, is what we are all about." said Cory Andrichuk, Principal Founder of the Travel Agent Revolution. The Travel Agent Revolution launched their new website on June 25th. According to Mary Clegg Principal Founder of the Travel Agent Revolution, Travel Agents are able to join for as low as $12 per month which includes opportunities for certification training, mentorship, group business coaching, industry resources, and regularly scheduled live and virtual training events. The Revolution will also spear head a revolutionary consumer campaign that is aimed at promoting the value of using a professional travel agent when planning a vacation of a life time. “Making this type of training value packed and affordable for all agents is extremely important in today’s economy. Another focus that has been travel agent driven, is our goal to fund a social media consumer campaign that will educate the public to plan their next vacation with a trusted travel agent and not even consider any other booking options.” Clegg added. CLICK HERE WHEN YOU CAN AND USE WHATEVER YOU FIND. SHARE IT WITH YOUR COLLEAGUES AND SEND IN ANY QUESTIONS YOU HAVE ABOUT SELLING TRAVEL. YOU’LL FIND SOME OLD FAVOURITES AND A FEW NEW PAGES TOO. ENJOY! 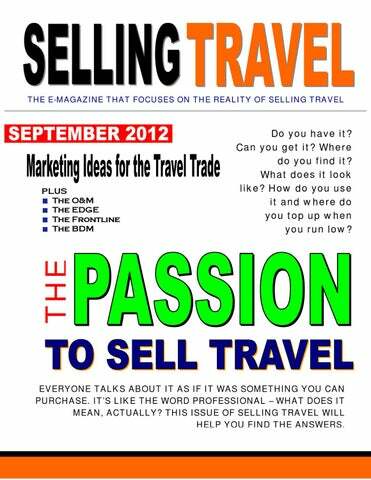 www.sellingtravel.net The SELLING TRAVEL website and SELLING TRAVEL eMagazine compliment each other and offer travel agency managers and staff a continuous flow of no fluff, street savvy sales and marketing “how‐to”. If you can help build the Selling Travel community it would be greatly appreciated by letting your agency colleagues and head office management team know about it. Keep watch for new ideas, new books, new self study manuals and more. A division of SMP Training Co.